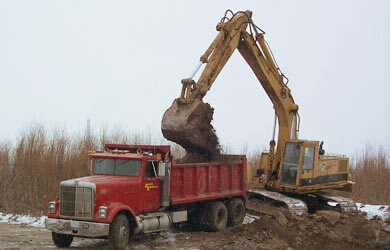 Often dredged material is simply mud (wet dirt) or wet sand. Contrary to popular belief, not all dredged material is contaminated. Using dredged material can offset the need to mine or import sand or soil from other areas. It can also save valuable space in costly disposal facilities for those really contaminated materials that cannot be reused. Clean dredged material can be used for a variety of purposes, including habitat restoration, topsoil enhancement, general fill, landscaping and road bed construction. Mildly contaminated materials can often be used for things like daily landfill cover, capping more contaminated sites, and as aggregate for construction materials that "lock in" the contaminants. This web site provides three different ways below for getting information about sources of dredged material near you. Frequently Asked Questions about the location, sources and kinds of sediment available for reuse at Great Lakes harbors and sediment storage facilities. Where can I find sediment near me? Where can I find sandy sediment near me? What harbor is close to me? Use this advanced map with tools to get more detail on harbors and sediment storage facilities around the Great Lakes. This web site is a preliminary screening tool to help identify potential sources of sediment for reuse. Information provided from this web site is generated from data provided by the U.S. Army Corps of Engineers. Appropriate state and local authorities may be able to provide additional information. Also, please visit Marketing Dredged Sediment for Beneficial Use for more information.